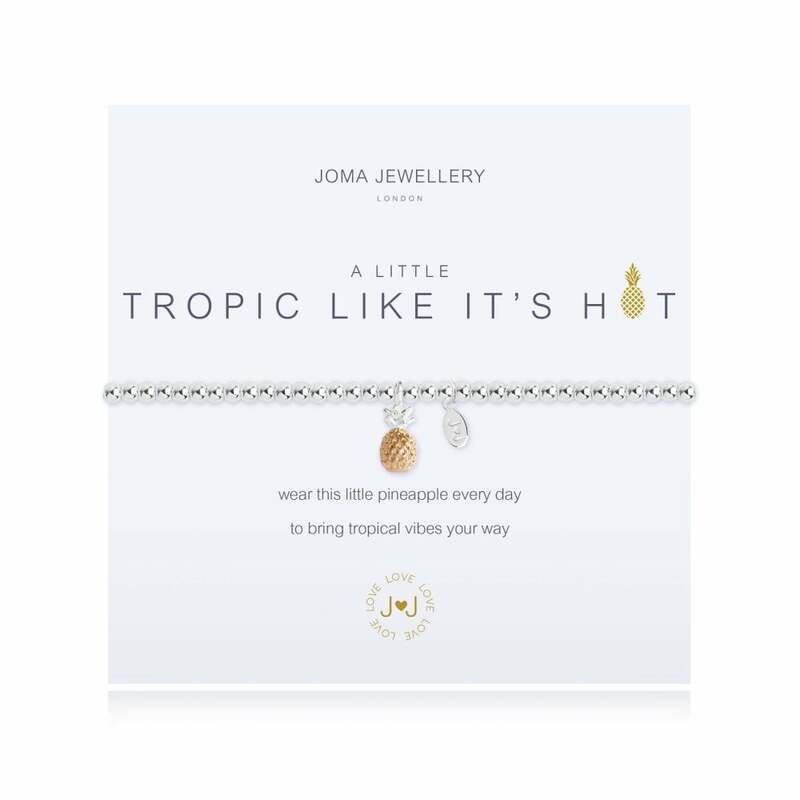 Feeling hot hot hot!Silver plated 3 times.Made with real crystals, stones or pearls.This Joma Jewellery bracelet is presented on a gift card that reads 'Wear this little pineapple every day, to bring tropical vibes your way'. What better reminder of exotic lands, tropical seas and gorgeous golden sands than this quirky little pineapple bracelet? This A Little Tropic Like Its Hot bracelet from Joma Jewellery will definitely bring a little sunshine to your day with its sweet, golden pineapple charm!Please keep your item dry at all times and away from perfume and body creams in order to preserve any plating and to ensure your piece lives a long and beautiful life.Each piece of Joma Jewellery comes in a gorgeous Joma gift bag with a gift tag for you to write the recipients name for easy peasy gift giving.MADE FROM: All Joma Jewellery is silver plated 3 times, strung with elasticated silk and made with real crystals, stones or pearls.MEASURMENTS: Adult size bracelet. 17cm length.